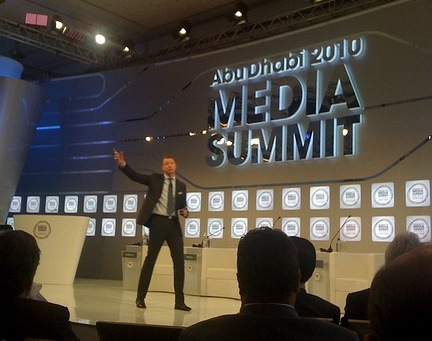 At the inaugural Abu Dhabi Media Summit 2010 I met Hans Vestberg, President and CEO or Ericsson. He gave a speech about the future of mobile media and communication and gave an outlook of key trends. The biggest opportunity field for Ericsson is the business of “connected devices” or how we would call it “the internet of things”. “We think that the networks are now developing. Our vision for 2020 is that there will be over 50 billion networked devices”, says Hans Vestberg during my interview with him. The Healthcare, Energy, Logistics and Media Industry will be using connected devices soon. Chipsets are getting more and more affordable to be implemented in any device. Mobile phones won’t be the only devices with a sim card anymore. Vestberg says that we are moving from “People to People” communication to a new era of “machine to people” and “machine to machine” communication. Hans Vestberg has been President and CEO since January 1, 2010. Mr. Vestberg had been Chief Financial Officer from October 25, 2007, until the end of 2009. He was named Executive Vice President in 2005 while serving as head of Business Unit Global Services, an office he held since 2003. From 2002 to 2003 he served as President of Ericsson in Mexico. Between 2000 and 2002, Mr. Vestberg was CFO for Ericsson in North America and Ericsson’s controller for the Americas. Between 1998 and 2000, he was CFO of Ericsson in Brazil. Since joining Ericsson in 1991, Mr. Vestberg has also held various managerial positions in China, Sweden, Chile and Brazil. Hans Vestberg was born in Hudiksvall, Sweden. He earned a Bachelor of Business Administration degree from the University of Uppsala, Sweden, in 1991.